A striking pattern of reports has emerged describing what appears to be a standard model UFO, of intermediate size between the small possibly remote-controlled---discs and the often-reported 35-40 foot (10-12 meter) in diameter or large models. Dating back to the 1950s, many witnesses have described discs (often Saturn-shaped) with transparent domes through which two small humanoid beings are visible. Although size estimates vary, most appear to be somewhere between 15 and 30 feet (4.5 and 9 meters) in diameter. The proportional size of beings to craft suggests a small two-seater "scout" vehicle with barely enough space to accommodate the two-entity crew. The reports imply a mission-oriented purpose. The beings in these cases often exhibit awareness of the witness, looking right at him or her. The craft performs characteristic maneuvers that include a downward tilt, during which instrument panels on board become visible, and rotation. Certain colors and light arrays recur. The following case summaries illustrate the Dyad "scout craft." July 13, 1959: Blenheim, New Zealand. 5:50 a.m. Mrs. Frederick Moreland, a part-time nurse's aide, was helping her husband tend their nine-acre farm. It was dark with low cloud cover when she went to the barn to do the morning milking. She noticed a green glow in the overcast and was halfway across the paddock when two large green lights emerged from the clouds and descended rapidly toward the ground in her direction. "I noticed that I was bathed in a green light [emphasis added] and that all the paddock was green, too." she later reported. In a statement to local police, she said that the green glare was so bright that she could not see her own "torch light" (flashlight beam). "It was a horrid sort of color. My first thought was, 'I shouldn't be here,' and I made a dive for the trees on the other side of the paddock." 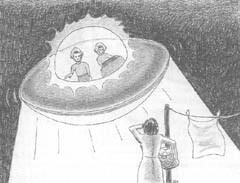 From the protection of the trees, Mrs. Moreland saw a distinct saucer-shaped object with two extremely bright sources of green light on its underside that illuminated an area of 50 yards (45 meters). Two rows of what seemed to be jets around the center of the object were emitting orange-colored flame. The rows appeared to revolve in opposite directions. The object, about 20-30 feet (6-9 meters) in diameter. hovered at rooftop level, about 15 feet (4.5 meters) above the ground. It was no more than 50 yards (45 meters) away from her. 'The jets stopped," she said, "and a light was switched on in what appeared to be a Perspex (plastic) or glass roof or dome [emphasis added], which glowed." The underside was a gray, metallic color. She could hear a faint hum, and "the air became very warm." Inside the transparent dome were two men "dressed in fairly close-fitting suits of shiny material." She compared the color to aluminum foil. They wore "opaque helmets" that rose straight from their shoulders. They seemed to be of normal size. One, she noticed, never moved. November 2, 1967, Ririe, Idaho. December 8, 1967; Idaho Falls, ID. December 8, 1967: Idaho Falls, Idaho. 7:40 p.m. Marilyn Wilding, 15, went out on her front step to look for a friend who was coming to pick her up. The evening was dark and overcast, and there was snow on the ground. A light reflecting on on the snow caused her to look up, and she saw a brightly lighted circular object "about as big as a car" hovering above the house. January 1, 1970: Duncan, B.C., Canada. About 5:00 a.m. Mrs. Doreen Kendall, a registered nurse, looked out a window at the hospital and saw a spacecraft-like object hovering one story above her, about 60 feet (18 meters) off the ground and 40 feet (12 meters) away. The object was Saturn-shaped, about 50 feet (15 meters) in diameter, silvery metallic, with a row of lights around the middle. Two humanoid figures in dark tight-fitting clothing were visible in the upper portion. They wore headgear that obscured their facial features. June 27, 1970; Rio de Janeiro, Brazil. 11:40 am. Aristeu Machado, his wife and children, and Joao Aguiar, of the Brazilian Federal police, saw a domed disc resting on the surface of the Atlantic Ocean, an estimated 700-1,000 meters (770-1,100 yards) offshore. It was a gray, metallic color. Two humanoid figures were standing on the rim of the disc. After a while the object skimmed the surface of the water and took off, lights flashing from its underside. Once airborne, the wife could see clearly the two occupants sitting inside the object. April 16, 1974: Casale Monferrato, Piemonte, Italy. 12:50 a.m. Mauro Bellingeri, 26, and his wife. Carla, were driving home to Santa Maria del Tempio when they noticed a bright object in the sky. The object dove abruptly toward the ear, stopping at a height of about 12 meters (40 feet). The Bellingeris both got out of the car to look at the now motionless and silent object. It was disc like with a bright, transparent dome and a central ring of revolving red. green, and yellow lights. Inside the round dome there were three human-like beings with large round, opaque grayish helmets. At the base of the headgear was a hose like apparatus reminiscent of oxygen equipment used by frogmen. May 3, 1975, San Antonio, Texas. May 3, 1975: San Antonio, Texas. 9:15 pm. Alois Olenick, 48, was driving his 1959 Chevrolet pickup truck westward on Mogford Road, south of the city, when an unidentified aerial craft approached and beamed a spotlight down on him. At the same time, his truck was nearly buffeted off the road as if by a strong wind. As the UFO approached, the main light on its front changed from amber to a "bright, cherry red," becoming most intense during the close encounter. "When the craft got directly over the top of my pickup." Olenick said, "my lights went completely out and my engine was dead." The object was basically globular in shape with protrusions on either side that could have been a central ring (making an overall Saturn-shape). The bottom looked like "highly polished metal" with a reddish glow, possibly a reflection of the primary red light. 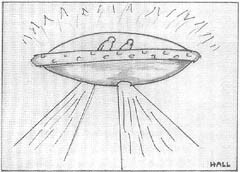 Visible inside the transparent dome on top were two humanoid beings. During the close-range sighting, the craft was tilted at about a 40-degree angle and oriented so that one of the occupants was directly in Olenick's line of sight He said, "They appeared to be just as interested in me as I was in them. One of the occupants, the one farthest away from me, appeared to be the pilot and had his hands on what looked like controls [emphasis added]. He was looking up and away from me. The other occupant looked directly at me [emphasis added]... and appeared to be observing me. I got a good look at both of them. They weren't human beings like we see here." The beings appeared to be five feet tall or under, bald, with prominent ears and a prominent nose. Their eyes were like slits, and their skin was smooth and gray. As the UFO departed almost instantaneously, Olenick heard a very loud wind sound that he compared to a cyclone, and his truck was buffeted. Late September 1977 (See illustration at top of page): Parkstone, Poole, Dorset, England. 11:00 pm. Mrs. Ethel May Field, 62, was in her backyard taking clothes off the clothesline. She heard a humming noise and looked up. The sky was clear. Approaching from the south-southwest she saw a circular object with a dome on top emitting brilliant light. Its surfaces were gray, and brilliant blue-yellow (green?) light was being emitted from the underside. The object appeared to be about 20 feet (6 meters) in diameter. Through windows in the dome she saw two humanoid figures visible almost to the waist. The object stopped and hovered above her garden, its light so brilliant that she put her hands up to shield her eyes. When she did, she felt heat on her hands and a trembling or vibration of the ground for a second or two. The occupants had silver suits and headgear. Their faces appeared slender, their arms normal, their hands covered by silvery material. The figure on the right appeared to be operating controls, his hands extended downward and out of sight. The being on the left was looking directly at her, and made a gesture as if pointing downward, which she interpreted as being an intention to land. This alarmed her and she ran back to the house to alert her husband and child. She paused at the door to glance back and saw the object speeding away to the northwest. Small craft with two beings have been observed on or near the ground in many other humanoid encounter and confrontation cases. 1. Donald E. Keyhoe and Gordon I. R. Lore Jr.. UFOs: A New Look (Washington, D.C.: National Investigations Committee on Aerial Phenomena, 1969), p. 19; Richard H. Hall, ed., The UFO Evidence (Washington, D.C.: NICAP, 1964), p. 182. 2. A.P.R.O. Bulletin, September-October 1967, p.10; Scientific Study of Unidentified Flying Objects (New York: Bantam, 1969), pp.376-78. 3. Donald E. Keyhoe and Gordon I. R. Lore Jr., UFOs: A New Look (Washington, D.C.: NICAP, 1969). pp.29-30. 4. Victoria (B.C.) Times, January 5.1970; Ronald D. Story, Encyclopedia of UFOs (New York: Doubleday, 1980), pp.92-93. 5. Transcript of tape-recorded interview by Renzo Cabassi, Comitato Nazionale Indipendente per lo Studio dei Fenomeni Aerei Anomali, Bologna, Italy; Inforespace, no.21 (June 1975): 20-22. Casale Monferrato is a rich, agricultural area and a prosperous industrial zone. Cabassi reports that it is also an important seat of military garrisons, and 30 km [18 miles] away at Mortara is a military air command center which in 1973 was involved in a radar- visual UFO sighting. The UFO seen by the Bellingeris departed in the direction of Mortara. 6. Skylook, February 1976, pp.3-4; San Antonio (Tex.) Evening News, February 20,1978 (sketch and good detail in a retrospective interview by Mike Ullmann). 7. Flying Saucer Review 24, no.2 (1978): 6-8, investigated by Leslie Harris. 8. MUFON UFO Journal, December 1981, p. 15; Canoga Park (Calif.) Chronicle, August 16, 1979. This web page was created by Francis Ridge for the NICAP web site. The information and images for this report were extracted with permission from Richard Hall's book Volume II The UFO Evidence: A Twenty Year Report, pages 456-464.